You don't need to own a boat to sail at Cooper River. Read on about our boat usage program. The Community Sailing program allows knowledgeable sailors to schedule and use Club owned sailboats. You do not need to own your own boat to sail at Cooper River. 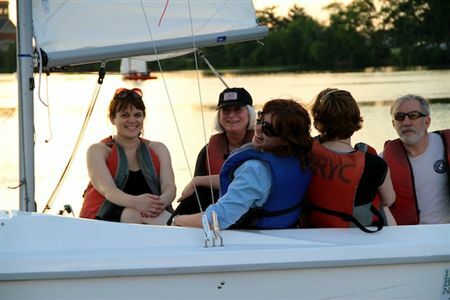 Membership in the Community Sailing program is a very cost effective way to sail as often as you like without the expense of owning and maintaining a sailboat. An online calendar showing all the available boats and times is available when you click on "Schedule your appointment now", below. CS Members may utilize the online registration program below and if you reserve 24 hours ahead, your boat will be waiting for you at the edge of/or in the water when you arrive. You will be able to reserve your boat up to two weeks in advance. During the sailing season, daily sailboat registration will also be available at the club. Community Sailing will be cancelled when wind gust exceed 14 mph. Click on the links below for further information. The Club members provide a free mentoring program for all community sailors. The mentors can help you with all aspects of community sailing. Need help rigging your boat? A mentor can explain how and help you rig. Would you like an experienced sailor to sail with you so you may obtain the confidence you need to sail alone? A mentor can sail with you and share some of his skills and knowledge. A list of mentors with contact information is available at the Members Only section of the Club web site.